In the geography of the opera world, Richard Wagner’s imposing cycle, Der Ring des Nibelungen is Mount Everest. There is simply no equivalent to the four works that open with deep orchestral chords signaling the beginning of the world, and end with the demise of the gods. 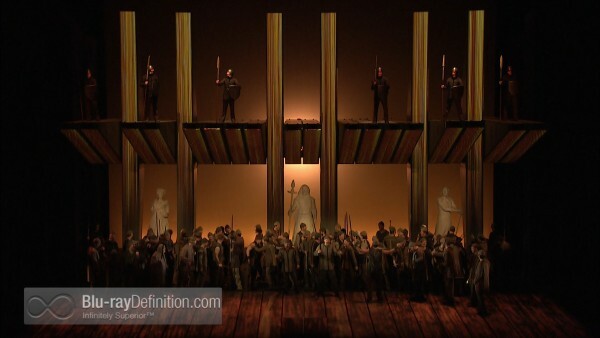 This Blu-ray set of the Metropolitan Opera performances debuted as individual high-definition movie theater transmissions between the 2010-2011 and 2011-2012 seasons. 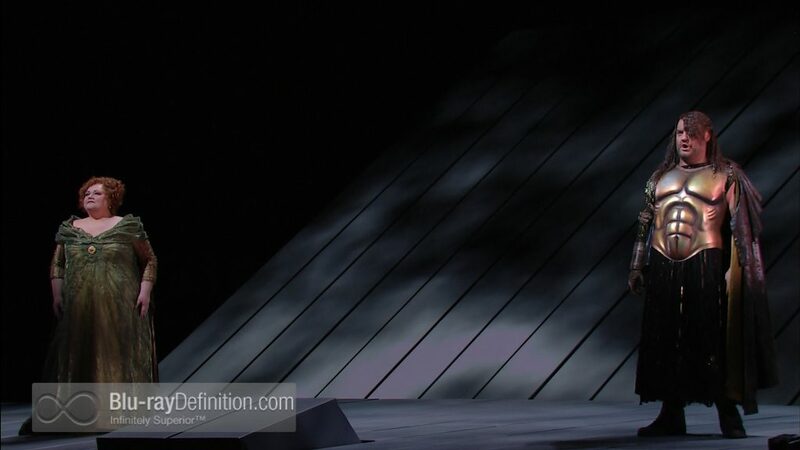 This was not only the Met’s first new staging of the Ring in more than 20 years, but Robert Lepage’s productions presented trail-blazing stage and dramatic conceptualizations. 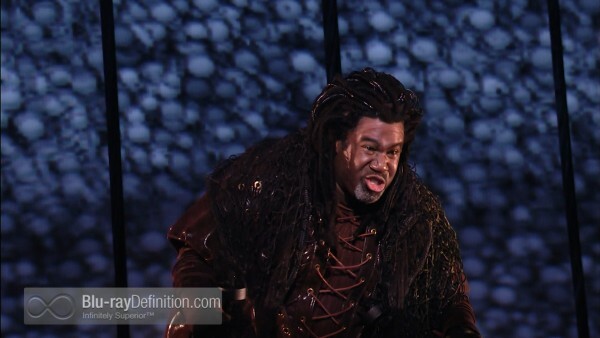 Most importantly, the Met had the benefit of working with some of today’s best Wagnerian singers and conductors. Leaving no elements to chance, the Met team enlisted veteran video and audio directors, Gary Halvorson and Jay David Saks, to complete the picture. Der Ring des Nibelungen presents a lengthy 17-hour story, rooted in Norse mythology, as will be summarized below for each opera. The timeless character of this operatic cycle resides in its amalgam of gods, demigods, and mere mortals who embark on a compelling journey of theft, betrayal, dysfunctional families, and ultimate redemption through love. The Ring begins as the dwarf Alberich (bass Erich Owens) steals the magical horde of gold from its keepers, the Rhine Maidens. Chief god Wotan (bass Bryn Terfel), has promised his sister-in-law Freia (soprano Wendy Bryn Harmer) as payment to giants Fasolt (bass Franz-Josef Selig) and Fafner (Hans-Peter Konig) for their construction of Valhalla, the new home of the gods. 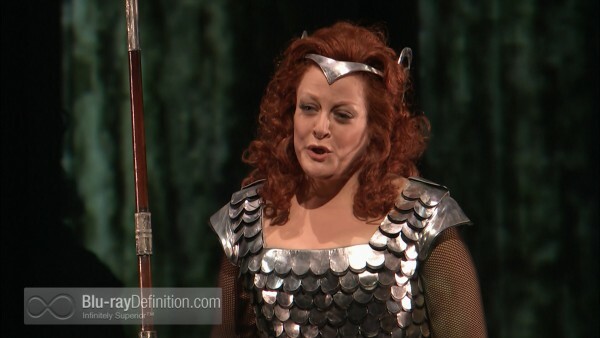 After Freia is abducted by the giants, Wotan’s wife Fricka (Stephanie Blythe) demands that he makes another deal: Freia will be exchanged for the Rhine gold. With the help of demigod Loge (tenor Richard Croft), Wotan steals the gold from Alberich, and gives it to Fasolt who is killed by brother Fafner. A rainbow bridge appears and the gods triumphantly enter Valhalla. 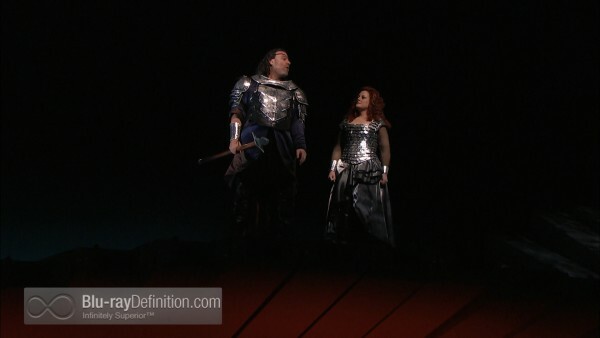 Years later, Wotan has fathered twins Siegmund (tenor Jonas Kaufmann) and Sieglinde (soprano Eva-Marie Westbroek) who meet at the home that Sieglinde she shares with husband Hunding (bass Hans-Peter Konig). The siblings fall in love and elope only to incur the wrath of Fricka. Ultimately, Wotan must right this wrong. 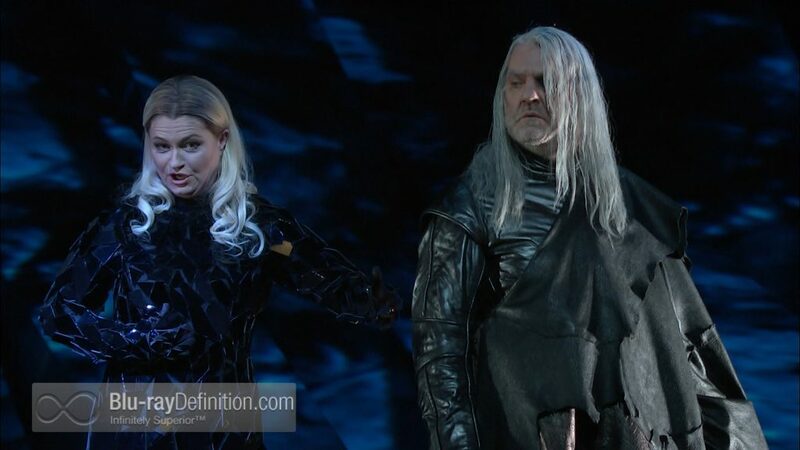 However, his favorite daughter Brunnhilde (soprano Debora Voigt) takes up the cause of the twins, and although Siegmund is slain by Hunding, the Walkure enables Sieglinde, now pregnant, to escape. At opera’s end, Wotan punishes Brunnhilde’s disobedience by putting her to sleep, surrounded by a circle of fire, penetrable only by a hero. Siegmund and Sieglinde’s incestuous union has produced a son who holds the ultimate future of the gods. This child, Siegfried (tenor Jay Hunter Morris), comes of age in the third installment of the ring cycle. Realizing that Alberich’s brother Mime (tenor Gerhard Siegel) is not his biologic father and, is planning to kill him once he has recovered the Rhine gold, Siegfried goes on a voyage of self discovery. 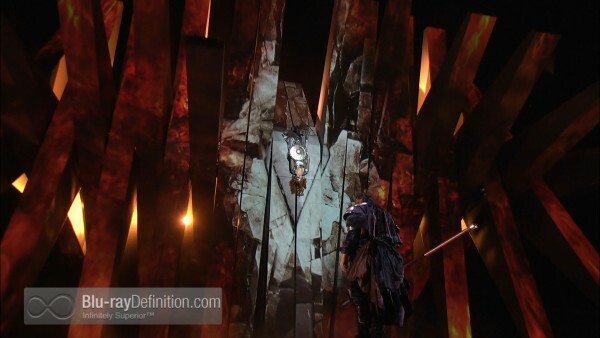 On his way, he encounters an elderly Wotan, and breaks the god’s spear, symbolizing the end of his power. Siegfried finds and kills Fafner, keeper of the gold, now transformed as a dragon, and discovers Brunnhilde, awaiting a hero’s kiss to awaken her. The final opera brings Siegfried and Brunnhilde to the hall of the Gibichung family, brother Gunther (baritone Iain Patterson) and sister Gutrune (soprano Wendy Bryn Harmer). 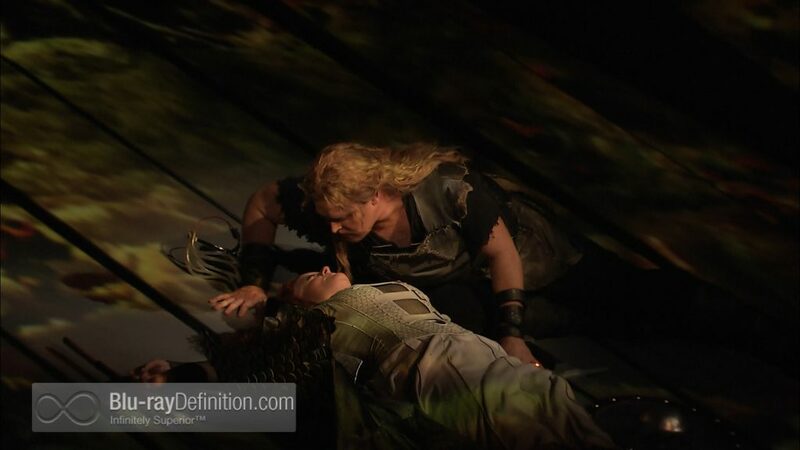 Hagen (bass Hans-Peter Konig), Alberich’s son, seeks to recover the Rhine gold by tricking Siegfried into winning Brunnhilde for Gunther and then wedding Gutrune. The plot thickens when Brunnhilde, irate over Siegfried’s apparent betrayal, conspires with Gunther and Hagen to have Siegfried punished. On a hunting trip, Hagen kills Siegfried and, at his funeral, Brunnhilde, now realizing her mistake, rides on to the pyre, while the Rhine overflows and Valhalla is destroyed. At last, the Rhine maidens recover their precious gold, ushering in a new age on Earth. The Metropolitan Opera has benefited from many years of experience with broadcast video. This production is a prime example of how well the cameras understand the stage, the singers and the audience. The impact of the novel set is very well conveyed and achieves some truly spectacular special effects. At times it is a wall of fire, at other times a lush forest or a rainbow bridge, and at still other times, the Rhine itself. 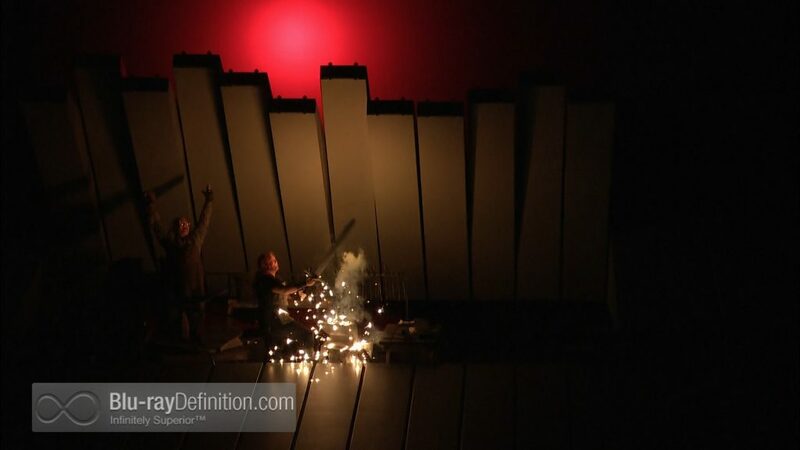 You will eventually forget that the set, affectionately called “The Machine,” is an integrated series of planks that receive animated projection and some inspired lighting. The only visual shortcoming, one that I also noted in the HD broadcasts that I saw in the theater, was some softening of detail, primarily in the darker scenes when compared to the very best out there. The sound engineers capture the Lincoln Center opera house acoustics as well as I have ever heard them. In a close to perfect sonic venue, the orchestral/vocal balance is very nearly what I heard when I attended this Ring Cycle four months ago. Make no mistake, the surround sound ambience of the DTS-HD Master Audio 5.1 track and the projection of voices and orchestras is what you would pay big bucks for in person. The 2-channel track is quite good, but does not deliver the Wagnerian wall of sound like its 5.1 counterpart. We get a full basket of goodies with this set, including a bonus disc, “Wagner’s Dream” from Susan Froemke who gave us “The Audition,” five years ago, a wonderful DVD that chronicles the Met Opera’s annual search for new singers. “Wagner’s Dream” is an illuminating two-hour film that follows the creation of this new Ring Cycle along with cast members, stage hands, general manager Peter Gelb, and producer Robert Lepage. Seeing the operas come to life, step by step, overcome initial glitches, and a short-notice replacement for Siegfried (tenor Morris), and longer-notice replacement for maestro Levine, makes it all the more amazing that everything really worked as intended. Other extras, included with each disc are backstage interviews with a number of the principals, including Bryn Terfel, Deborah Voigt, Stephanie Blythe, Jonas Kaufmann, Eva-Marie Westbroek, Jay Hunter Morris, Eric Owens, and producer Robert Lepage. 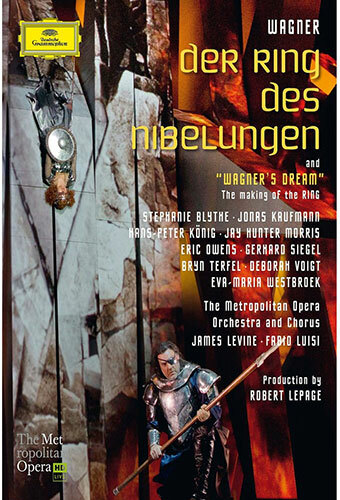 As a self-confessed Wagner junkie, I already own more video and audio sets of the Ring Cycle than is probably good for me, including the Met’s previous 1989-vintage Otto Schenk production, led by James Levine. That worthy DVD release featured as good a cast as could be assembled for the times, headlined by stars like James Morris (Wotan), Hildegard Behrens (Brunnhilde), Jessye Norman (Sieglinde), Christa Ludwig (Fricka), and Siegfried Jerusalem (Siegfried). 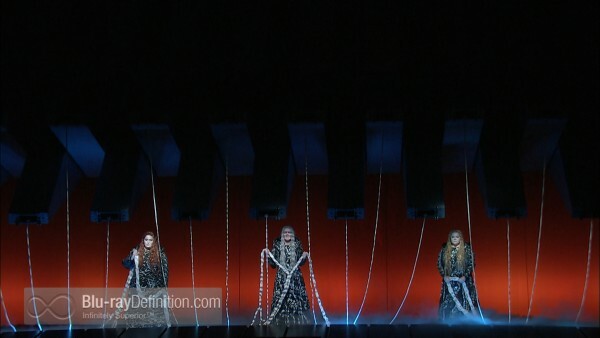 Unlike this new BD, costumes and sets were relatively traditional and there were few special effects. Recorded in standard definition with Dolby 5.1 surround and DTS soundtracks, it remains a very good watch. Two previous Blu-ray editions have been released. 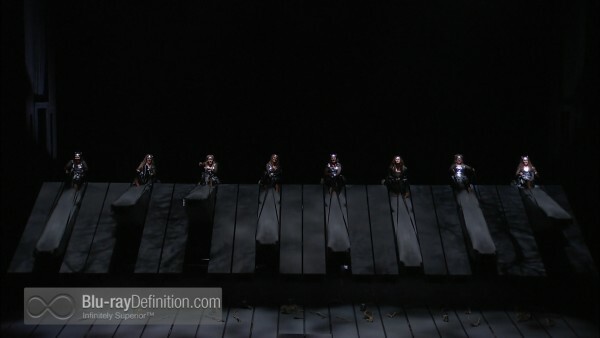 One, from the Weimar opera can be easily dismissed on artistic and conceptual grounds. The other is a visually outlandish production by Valencia’s Fura del Baus company. Offering some strong individual performances and decent, if not inspired, conducting, it is simply not in the same league as this new Met BD. In the final analysis, the genius of Wagner’s Ring Cycle is that it can succeed in so many varied musical interpretations and directorial/staging concepts. I heard some traditionalists attending these performances mutter disparaging comments about the Lepage version of the Ring. 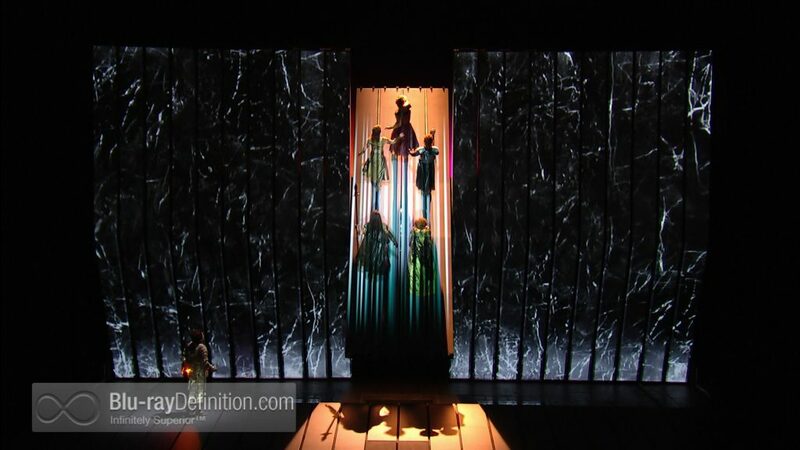 Having seen it live and on the big screen, I can assure potential viewers that this production really works and, possibly gets closer to the composer’s original staging intents than the so-called traditional approaches. 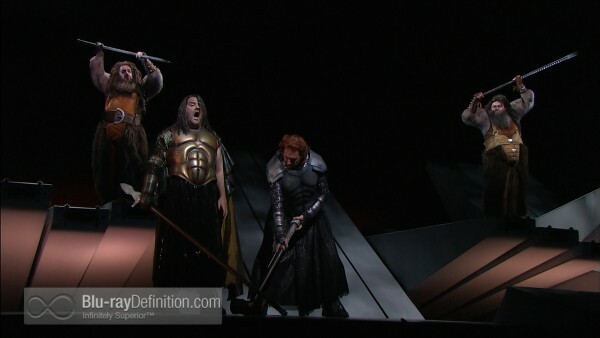 Opera purists may quibble about some of the singer’s performances, occasional stress in Voigt’s Brunnhilde, some lack of gravitas in the Terfel Wotan, a bit of caution in Morris’ Siegfried. As an opera veteran, I have never heard a completely note-perfect live performance, and yet, live performances give us a frisson that simply eludes the studio recording. 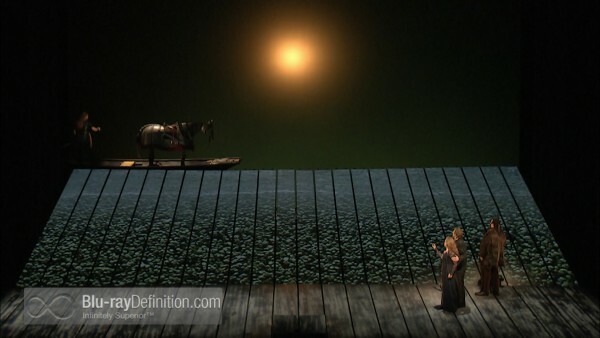 Having a cast as good as this one, with significant strengths in the pit from conductors Levine and Luisi, camera work as only the Met’s crew can do, and the magnificent sound of the Met’s house, this BD set may raise the bar impossibly high for any successors. Park any preconceptions at the door, just enter and get this one.